Today, shorter product life cycles, faster time to market, and leaner margins present major challenges for the semiconductor industry. Cadence recognizes that to overcome these hurdles, you need more than innovative technologies. Behind each Cadence® product stands world-class support. A Global Customer Support infrastructure provides you with timely access to a vast knowledgebase of existing solutions and timely access to Cadence technical experts. This ensures you get the assistance you need—when you need it—to keep your design effort working at the peak of productivity. The Cadence Global Customer Support team strives to provide flexible access to the expert support you need to successfully resolve any EDA challenge or technical issue. Whether it's fast access to our knowledgebase of solutions and technical documentation or direct collaboration between your team and Cadence technical experts, Cadence is committed to providing efficient technical support that fits your needs. Cadence assists companies all over the world by providing expert response to technical issues for the complete suite of Cadence products. This Global Customer Support helps customers to accelerate product development, reduce time to market, and keep CAD and design teams productive. The Cadence Global Customer Support team is committed to providing the help you need to resolve any product-related issues. 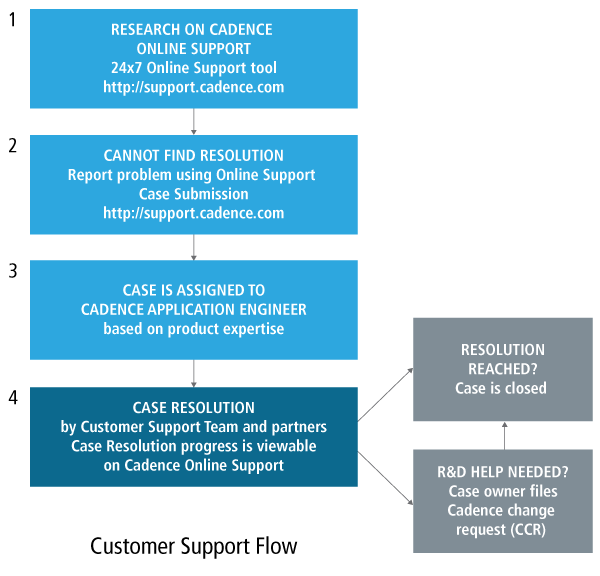 Cadence Support application engineers located worldwide have deep and comprehensive product expertise. In order to stay on top of the most current updates and features, Cadence Global Customer Support professionals train continuously and also work closely with Cadence Sales, Field, and R&D organizations.